Amy J. is an American citizen who lives in Norway. In July 2013 her worst nightmare began. Without any warning, the Norwegian Child Welfare Services known as ‚Barnevernet‘ accompanied by police knocked at her door, saying that her 19-month-old son Tyler had to be taken to a hospital for an examination immediately. What happened? In the weeks leading up to the taking of Tyler, the young mother was increasingly concerned about the growth curve of her son. Tyler did not yet want to move to more solid food but instead continued to prefer breastmilk. Tyler was Amy’s first child, so she lacked the experience to know that children can develop quite individually. But, being a concerned mother, Amy even took Tyler for medical check-ups three times a month in order to monitor the growth process very closely. Then, came the summer. Amy went on a vacation with Tyler to America for two weeks and visited friends and relatives. But, as soon as they returned back to Norway, the Child Welfare Service, together with the police came to her house, saying that Tyler must be examined immediately in a hospital. Amy found out later that someone had alerted the Child Welfare Office in order to maliciously harm her. Being completely overwhelmed by the situation Amy agreed to go to a hospital with them. Also, Kevin M., the Norwegian father of the child came along. At the hospital a doctor diagnosed Tyler with a slightly ‘underweight’. The boy would have had to weigh 10 kg, the doctor said. But Tyler weighed only 9.6 kg, which is actually not a reason for a concern according to the weight charts. The doctor also criticised that Amy was still breastfeeding her son. Instead of offering advice to improve the nursing, the employees of the Child Welfare Office now wanted to intervene on the basis of the medical diagnosis and remove the child from the mother. This led to a verbal confrontation which the father filmed with his smartphone. It’s a scene that can now be found on Youtube. „When will I see my son again?“ asked Kevin M. „We cannot tell you that yet,“ replied one of the employees of the Child Welfare Office. Finally, Kevin is ejected from the hospital as the argument got louder and louder. What followed next was like a scene from a Hollywood movie. Kevin went back to the hospital and put on a doctor’s outfit. In disguise, he was able to go to the room where his little son Tyler was brought in the meantime. He took his son unnoticed, left the building in a hurry, and drove around the area aimlessly, knowing that these might be the last moments with his son. Finally, he was stopped by several police cars. One police officer on the roadside even threw a big stone at the car, which nearly hit his child. Kevin then was detained for one night for attempted child abduction. He was released the next day, because a judge realised that Kevin was the biological father and he still had parental rights. However, little Tyler remained in the care of the Norwegian Child Welfare Office. For the time being the parents still had the right to visit and occasionally see Tyler – in a police station behind double-locked doors. But, a year later the visitation rights were cancelled. The authorities saw a potential abduction risk as Amy is an American citizen and they didn’t want her to take Tyler to America. In the following court trials this was also the main argument for removing parental rights from both her and Kevin. On September 22, 2014, Amy saw her son for the last time. Up to now both she and Kevin don’t know where Tyler is and how he is doing. Meanwhile, Amy has gone through all legal options in Norway to get her son back. In the spring of 2016, the case was rejected by the Norwegian Supreme Court. But, Amy doesn’t want to give up. Through a Christian initiative in Vienna / Austria, Amy was able to get in contact with international lawyers. They looked at her case documents, discovered Human Rights violations and helped her to file the case to the European Court of Human Rights. Also, the Christian initiative in Vienna showed further interest in the case. They launched a campaign on Facebook in order to raise awareness for Amy. 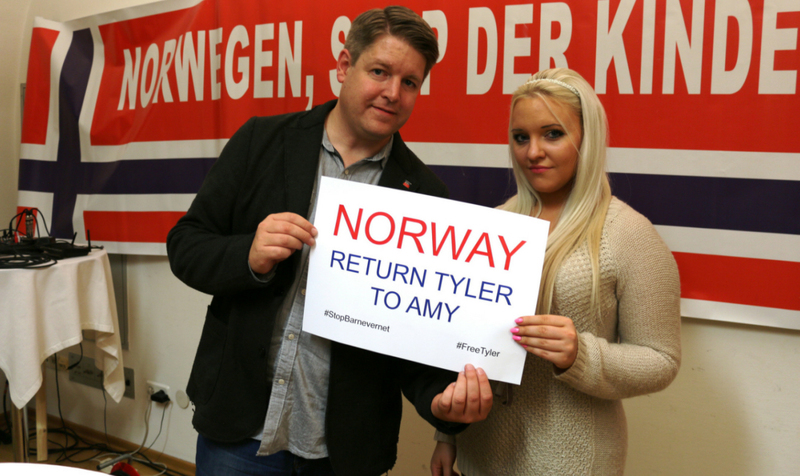 They’re challenging people to post a selfie of themselves holding a poster which states “Norway, return Tyler to Amy”. In September 2018 the CPS court (Fylkesnemnda) decided to grant forced adoption on behalf of the foster parents. The court actually found Amy to be a capable mother, but they still used her American citizenship against her, saying that this would still be a potential abduction risk. Also the court stated that Tyler hasn’t seen Amy for years and that he probably wouldn’t even remember her. Therefore it would be in the best interest of the Child if Tyler stays with his foster parents, even though reports indicate that the boy is asking who his real parents are. Meanwhile the foster parents have stated that they don’t wish any contact with Amy as they see Tyler as their own Child. Amy has appealed the recent descision and the case is expected to be at the court of appeal after New Years (2019). The injustice in this case is also revealed in the fact that Amy’s Norwegian lawyer gets only paid a few hours by the government (as it is custom in all CPS cases) while the CPS lawyer has free range of how many hours she uses to prepare the case, and gets paid for all of them. Amy is hoping to win back at least visitation rights, but if she looses at the court of appeal she will loose Tyler forever as the boy will then forcibly be adopted by the foster parents. She will even loose her right to fight for her son, as the Government will no longer pay for a lawyer.